Google is to open a new headquarters building in London which could see 3,000 new jobs created by 2020. The news comes as a major boost to Britain's technology sector. 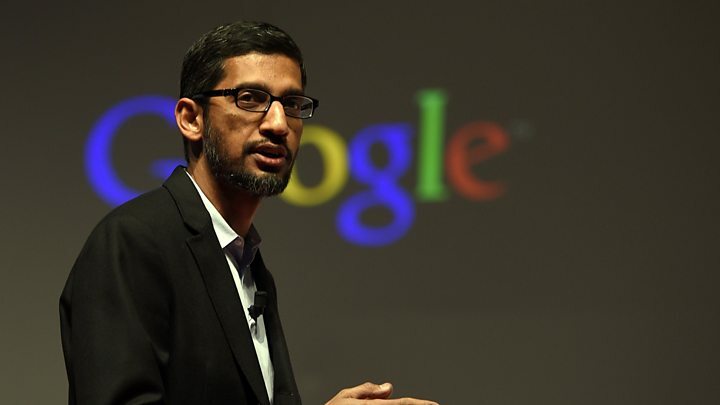 Sundar Pichai, the chief executive of Google, told the BBC that the UK was still an attractive place to do business. He said open borders and free movement for skilled migrants were "absolutely" important to the success of the technology sector in the UK. It was Mr Pichai's first European broadcast interview since he became chief executive last year. Sources at the technology company also said if barriers were thrown up to skilled immigration following the vote to leave the European Union, some of Google's investment could be at risk. Turning to the "fake news" controversy in America - and choosing his words very carefully - Mr Pichai said that, at the margin, false stories about Donald Trump and Hillary Clinton could have affected the outcome of the US election as the margins were "very narrow". And that it was important that companies like Google and other social media businesses promoted "accurate" stories to their billions of users. Although Google refused to be drawn on the cost of the UK investment, development experts said the new building in King's Cross and the cost of employing thousands more staff was likely to put the figure at over £1bn. At present, Google employs around 4,000 people in the UK, a figure that could now rise to 7,000. The office space owned by Google in King's Cross will more than double. "The UK has been a tremendous market for us," Mr Pichai told me. "We see big opportunities here. This is a big commitment from us - we have some of the best talent in the world in the UK and to be able to build great products from here sets us up well for the long term." The new 650,000 sq-ft headquarters has been designed by Thomas Heatherwick, the designer behind the "garden bridge" across the Thames. He was brought in by Google after its founders, Sergey Brin and Larry Page, rejected initial designs for a new headquarters as "too boring" in 2013. Danish architects Bjarke Ingels Group are also involved in the project. Many companies raised fears before the referendum that if Britain voted to leave the European Union, foreign investment would be affected. Questions were raised over whether Google would commit to the new building. But Mr Pichai made it clear the strength of the UK economy went far beyond the Brexit vote. "The innovation we see here, the talent we have available here and how on the cutting edge of technology we are able to be here makes it an incredible place for us to invest," he said. "We do value how open and connected it is and we can bring in talent from anywhere in the world and we value those attributes and we are optimistic that those will stay true over time. "So we did [make the investment decision] taking into consideration [the referendum], but we are very optimistic." He said Brexit may have complicated "secondary effects" over the longer term but it was too early to say what they may be. I asked Mr Pichai what the government's approach should be to immigration controls. "I want to be respectful," he answered. "These are important questions for the citizens of the UK to answer. "I think there are thoughtful debates to be had. "In our experience as a company, when we have been able to bring people together and operate in an open and connected way it achieves tremendous impact over time. "Those are the values we cherish, and we have been open and public about how we think about these things. "When I look at London [I see] a place in which we are able to attract great talent, find great talent in the UK, thanks to a great educational system here, but it has also been a place where people are willing to come from anywhere in the world. "Increasingly, for the kinds of complex things we do, we need to bring people who are across many disciplines - with many different backgrounds - together to solve problems. That's how you can build newer things, so that is particularly important for us." He said that he would "worry" if controls on skilled migration were made more stringent. Image caption Sundar Pichai said the US was "deeply divided"
Turning to events in America and the election of Donald Trump, Mr Pichai said it was clear the country was "deeply divided". "I come from India, I am used to a vibrant democracy, and it is the same in the United States. "It is important to remember that we had a democratic process and there has been an outcome. "As you can see the country is deeply divided so I tend to look forward and I think we need to figure out how to constructively engage with the new administration and hear the voices of people, as at Google we care about certain values - be it freedom of expression, the notion of inclusion and fairness, building open systems, building a connected world. "But it is also important to acknowledge that there are people, through a process like this, who feel left behind, and I am glad the democratic process gives voices to everyone." I asked him if the atmosphere in America had become nastier during the campaign and in its aftermath. "The rhetoric, for sure, did bother me, as it did many people during the election but I am hopeful there are a lot of founding principles - what makes the US the country it is - and I hope post the campaign season, as we move back into a governing phase, I think people will come together and we have a lot of important problems to work through." Following the presidential election, Facebook and Google have faced protests over the dissemination of "fake news", with their computer systems often promoting stories about Mr Trump and Hillary Clinton that were false. Some have even suggested that the stories may have affected the way people voted, and ultimately, the outcome of the vote, an argument dismissed by Mark Zuckerberg as "pretty crazy". In his interview with me, Mr Pichai was more circumspect, saying that social media companies needed to do more to promote accurate stories. "This is very important to us," he said. "At Google we have always cared about bringing the most relevant, the most accurate results to users and that is where almost all of our work goes at the end of the day. "It is important to remember that we get billions of queries every day. "And so it is a learning moment for us and we will definitely work to fix it. "Just in the last two days we announced that we will remove advertising from anything we identify as fake-news. "Over the last year we have looked at things like how do we fact check articles, the notion of trusted sources in journalism - how do we promote those better. "So there are a lot of initiatives we are undertaking so hopefully all of that will help us do it even better." I asked Mr Pichai whether he believed fake news could have affected the outcome of the election. "I think there is a lot of discussion about this in the context of social media. "I am not fully sure. "Look, it is important to remember this was a very close election and so, just for me, so looking at it scientifically, one in a hundred voters voting one way or the other swings the election either way. "So, when you talk about such narrow margins, obviously there are many, many contributing factors and so I think there is enormous debate because of that - I am not fully sure what caused this." Given those tight margins, I asked, could fake news have affected some people's vote - and maybe enough people's vote to affect the outcome. "Sure," he answered after a pause. "You know, I think fake news as a whole could be an issue. "From our perspective, there should just be no situation where fake news gets distributed, so we are all for doing better here. "So, I don't think we should debate it as much as work hard to make sure we drive news to its more trusted sources, have more fact checking and make our algorithms work better, absolutely." Mr Pichai said it was too early to say whether Google would change its corporate tax structure if Mr Trump followed through with his campaign pledge to cut American business taxes. With business tax rates currently above 30%, many global companies like Google shelter a substantial proportion of the profits they make in offshore tax jurisdictions. "We have always said that the US corporate tax structure is part of the problem in the overall corporate structure globally for multi-nationals," Mr Pichai said. "To the extent that there is progress there I think it will help us arrive at a better construct but the solution needs to be comprehensive and needs to work for all companies involved." I asked the Google chief executive about the controversies the company has faced over the payment of taxes and over accusations it has used its market dominance to crush opposition businesses. "As a company, we want to be a good citizen in every market we are in and that is true for the UK as well," he said. "To your question on tax - today, we contribute a lot to the UK economy and we enable for example small businesses to be the engine of any economy. "We are happy to pay our fair share of tax. "As you know tax is a global construct. We are a multi-national company in well over 100 countries and we have advocated comprehensive tax reform so we can engage and get to a better place. "But I think it is important to remember that we are one company in a global system and it is more important for governments and citizens to sort out the right structure and we are always happy to engage in a thoughtful and constructive manner." On criticisms from competitors and in Brussels that Google has acted anti-competitively, Mr Pichai said "there has never been a day at Google where we have had a construct like that". He said the company developed technology that was shareable and focused on what consumers wanted.